Homemade Lasagna & Pizza Supplies...On Sale! High quality cooking supplies! Each Lasagna Pan is high heat fired with a durable scratch resistant glaze. These pans are easy to clean too. 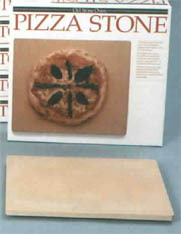 Our Pizza stones are MADE IN THE USA. 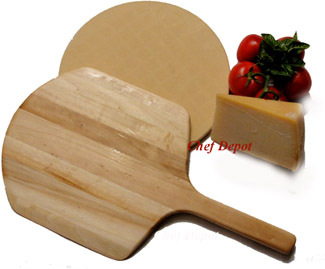 Our pizza peels are made from solid select hardwoods. 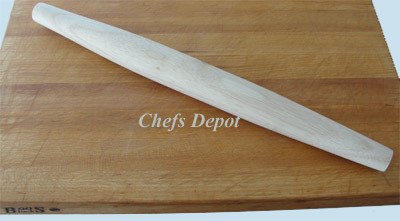 Our pizza knives are NSF certified for quality. Our pizza delivery bags have been designed to keep pizza hot for a long time. Our pizza cutters and tools are Chef Tested for size, shape and comfort. 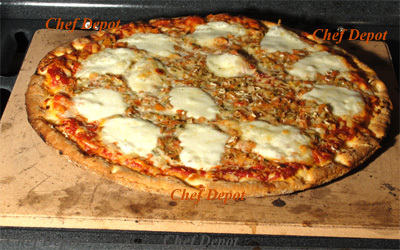 Many more pizza supplies are available, click the green arrows on the bottom of this page. 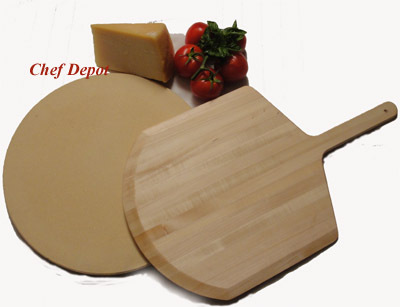 Please email us for more pizza supplies! Pizza Supplies are on sale below! Click here to print our Pizza Dough Recipe ~ it works great for Foccacia too! Theres nothing like homemade lasagna, especially one that uses unique ingredients to create a culinary masterpiece the whole family can enjoy. With its enameled exterior and superior heat retention, this oven to table porcelain pan can be served quickly. Buon appetito. Measures 13 in. x 9 in., weight is aprox. 5 lbs. Heat proof to at least 500 degrees F. Cleans easily too. Chefs Note: This is a sweet lasagna pan and doubles up as a great foccacia pan! 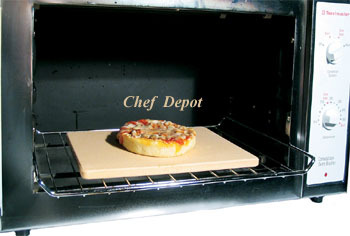 We use one inside the oven and another outside on the pizza stone BBQ grill! Can also be used for vegetable lasagna and casseroles! 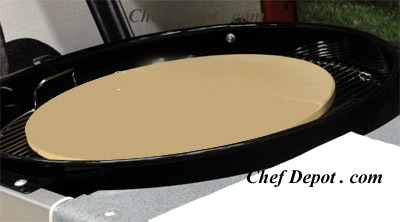 Designed By Chefs! We love the earthy colors! Wheat Colored glaze on outside. Theres nothing like homemade lasagna, especially one that uses unique ingredients to create a culinary masterpiece the whole family can enjoy. With its enameled exterior and superior heat retention, this oven to table porcelain pan can be served quickly. Buon appetito. Measures 13 in. x 9 in., weight is aprox. 5 lbs. Heat proof to at least 500 degrees F. Cleans easily too. Butcher Block Tables! We can help design your new kitchen. 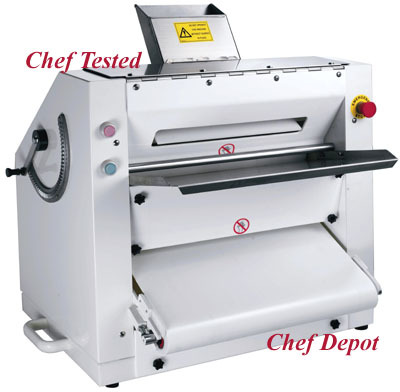 Click Here ~ more PASTA MAKING EQUIPMENT! 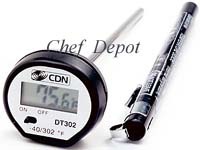 Our new Digital Thermometer is a great value. Features: - 40 to + 392 F., 5 in./12.7 cm stem, Shatterproof, very accurate, For thin cuts of meat, fish or poultry, One button operation, Food-safe ABS plastic, Stainless steel stem, Temperature guide on sheath, Sheath can be used as handle extension, Pocket clip, 1.5V Button, battery included, is a IEC LR44 Alkaline. 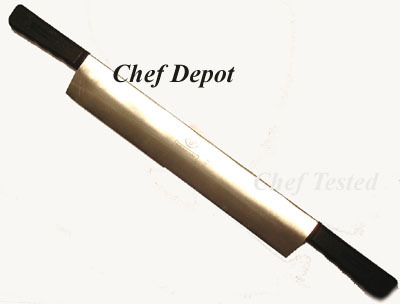 Chefs Note: Nice tool for flipping burgers in a frying pan or on a griddle. Other Spatulas are located here. This is the best pizza oven brush we have ever tested. Easy to use, solid hardwood, brass and hard zinc steel. A pizza brush that will last and keep your oven clean. 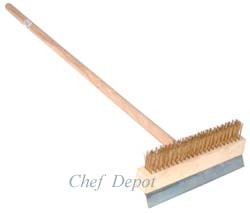 The food safe heavy duty Pure Brass Bristles help with cleaning off baked on items and the galvanized steel scraper blade helps remove crumbs and ashes. Ours features a cast metal screw piece on the end of the hardwood handle, this securely attaches into the hardwood head making it more durable than the cheap ones at our competitors! The overall length is aprox. 38 in. Other size brushes are available for more coins. 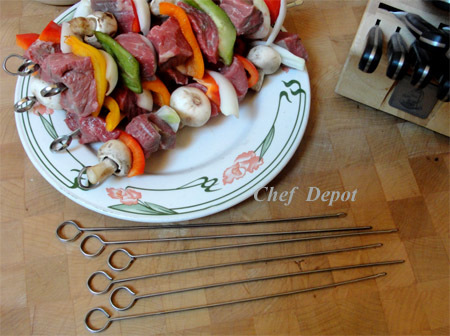 Click Here for Chef Tested Knife Sets! More Portable Burners & Stoves! This is the best Maple Turkey Carving Board that we have tested! 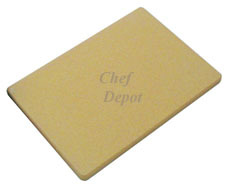 The cutting board of choice for all the Chefs here at Chef Depot! This board is heavy (13 lbs.). 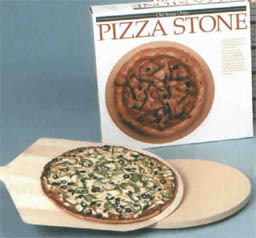 Our Old Stone Oven Toaster Oven Pizza Stone is made from triple fired clay, it is thick and strong. It is the perfect choice for a crispy crusted pizza, or crunchy garlic bread, every time. Measures 7 in. x 10 in. These were designed to perform without cracking at temperatures approaching 2000 F., made from an exclusive and unique heat resistant compound. Made in USA. These can be used in a toaster oven or on a grill or inside your oven. Great for crisping bagels, bread and keeping rolls warm. Why not order two? A great gift idea. 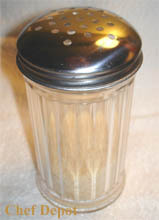 Our 12 ounce cheese shaker is made with a solid stainless steel shaker top. 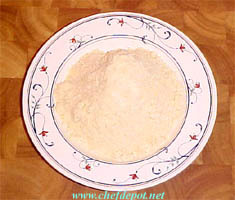 It is perfect for parmesan cheese, crushed pepper or spices. 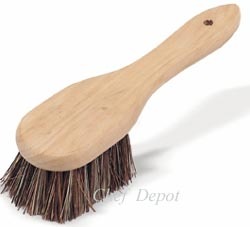 Chef Notes: We use one for grated parmesan cheese. 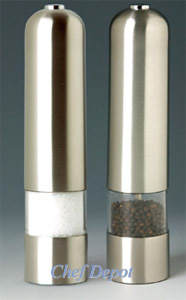 We use another for Crushed Red Pepper and our Italian Spice blend! Restaurant and pizza parlor customers love these! 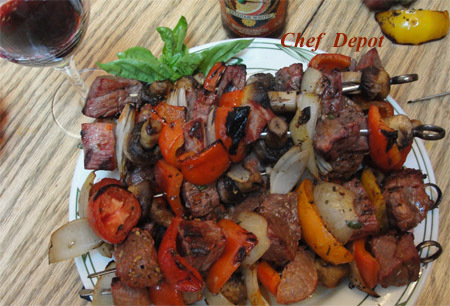 Click Here for Fish & Game Recipes! Our classic grated Parmesan Cheese is aged for over 10 months. It has a perfect nutty taste and a more coarse texture than the lower grades found in most grocery stores. This cheese is aged for over 10 months. Our shelf stable packaging means no refrigeration is needed until it's opened! 12 oz. resealable container. Chefs Note: One taste and you will know Italian quality. Crusty garlic cheese bread, sprinkled on pasta, pizza and salads, We love it on most everything! This electric pizza dough roller makes phigh volume pizza production a snap! Let us help you with your restaurant operations effeciency. Our dough roller will help you and your staff save time and training costs. Within seconds employees can make uniform products without tossing, slaping or rolling the dough by hand. Ergonomic design saves space. 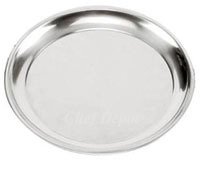 Small size fits easily on a cart or stainless steel prep table, measures 32 in. x 28 in. x 32 in. The handle is solid stainless steel rollers are made for years of daily use. This is a 1 hp. 115 volt gear driven machine. Up to 700 pieces per hour. Push botton controls offer 1 touch convenience. Simple 2 pass system. Drop dough in top, slides into tray, comes out at bottom. NSF, ETL, CSA, CE approved. Weight 360 lbs. Free shipping to most areas of USA. Call us for options. 1 Year Parts Warranty, plus extra 90 days labor. You can save 3% by sending us a bank check. 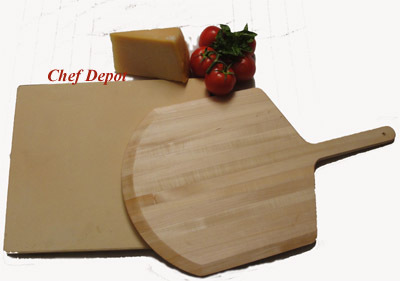 Large cutting boards can not be shipped outside the USA. 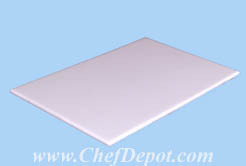 Choose from several sizes of our Extra Thick White Poly Cutting Boards, USA made, NSF Certified! Click here. 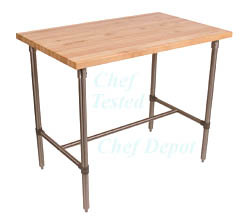 John Boos & Chef Depot have created the new Kitchen Breakfast Island Table. This Restaurant-Style table has a 1 1/2 in. thick solid maple top. Perfect for a breakfast bar island, food prep, holiday parties or casual dining. This table is constructed from 1 1/2 in. thick first grade solid blended rock maple with a clear coat of FDA approved food safe varnish finish. The tubular stainless steel legs are joined by a metal I Bar for optimum stability. The swivel stools below are a perfect match for this table. Four stools will easily store underneath when not in use. The lower bar also makes a great foot rest! Choose from two table top sizes and two heights below - Tables sizes are 48"W x 30"D OR 48"W x 24"D - Table heights are 36 inch or 40 inch tall! Commercial grade locking caster wheels are available! Also available in Cherry Wood! Click Here! 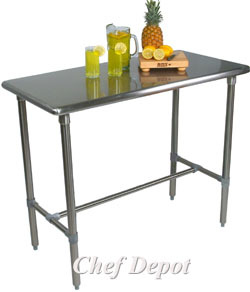 This is the Cucina Classico Stainless Steel Table. The Food Service Grade Stainless Steel (18/8 grade) has a polished top and Bullnose corners & edges for great looks and safety. This table has adjustable feet for levelling. The open base accommodates two counter stools on each side (Order Below - Not Included). This table is available in two sizes 48 in. x 24 in. -OR- 48 in. x 30 in. There are also two heights available, 36 in. Or 40 in. high overall. These tables are custom made to order and shipped from the factory. This is the highest quality you can buy. Made in USA. 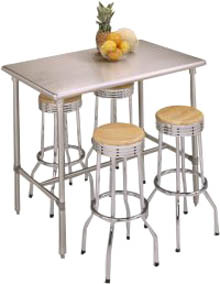 Custom Made Bar Stools, click here! Our Premium Dough Mixers are made in the USA! We have the best prices and longest warranty, including repairs for several years. 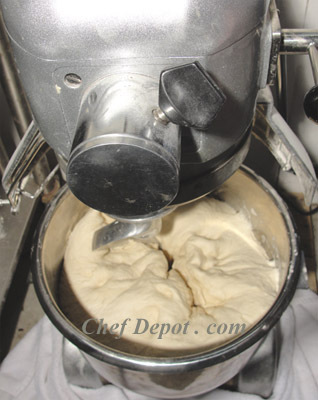 Click Here for our Premium Dough Mixers! We test them and we use them.